I have received comments and messages on our Facebook page asking how this all works and what is entailed so they can make the decision if this is something they want to dive into in order to recognize their local officers. Let me start with a quick history (very quick) about how we arrived here. Just several days ago (literally!) I was feeling rather disheartened over the current news regarding our officers. In knowing so many personally (and being related to one), I hated to see the stress and the worry within their families knowing so many are such amazing people who are now faced with more hate than ever. With this, I decided I would bake and deliver some goodies for Christmas. Just a short time later, I decided I would mention it on Facebook in case I could find a few friends to bake with me. The amount of support I received in those first few hours told me this project had so much potential. With that, Cookies for a Cop was born. At the time of this posting, we have been active with this for just 3 full days and already have OVER SEVENTY (70) law enforcement agencies covered in a total of SEVEN (7) states! I cannot express how moved I am with this incredible desire to support this campaign for our cops! AREA: Find an area you would like to cover (or help cover if already represented by a leader). I promise you that you may be surprised with how many departments are small enough that you could handle the task on your own. If you want to lead an area, please make sure this is approved through this site before proceeding and gather only friends and family you know and trust. If you take a lead role, please make sure to follow up below with more details for that position. TREATS: Once you have zeroed in on an area or a team to work with, decide what your treats will be. We ask that everyone make five (5) dozen. This will allow the love to go even further. Please note that while the name is COOKIES for a Cop, you don’t have to limit yourself to cookies. Feel free to ease the load a bit with a batch of brownies, some Rice Krispie treats or other such item that can go a bit further with less effort. You could even dunk some Oreos or pretzels in chocolate and know that you will have plenty of smiles as a result! PHOTOS: As you bake, shop, sort, package and deliver, make sure you are taking pictures of the whole process! We want to see the love and the smiles. CARDS: Purchase some cards and sign them wishing these officers and civilian workers a blessed holiday. If someone helps or you have kiddos, have them sign too! 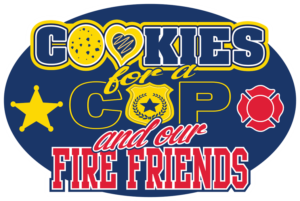 LABEL: Email me for the PRINTABLE TAGS so you can attach to each cookie assortment showing that you have joined hundreds of others across the US in bringing love to them through Cookies for a Cop. Imagine how much more your love to them will mean when they realize that your love was multiplied by hundreds for thousands of their brothers and sisters in law. I get chills just thinking about it! In an approved lead role? Let me help you…. CALL YOUR DEPARTMENT: Before you get too far into things, make sure to call your local department(s). Ask exactly how many sworn officers there are (full and part time) as well as any dispatch / civilian workers. 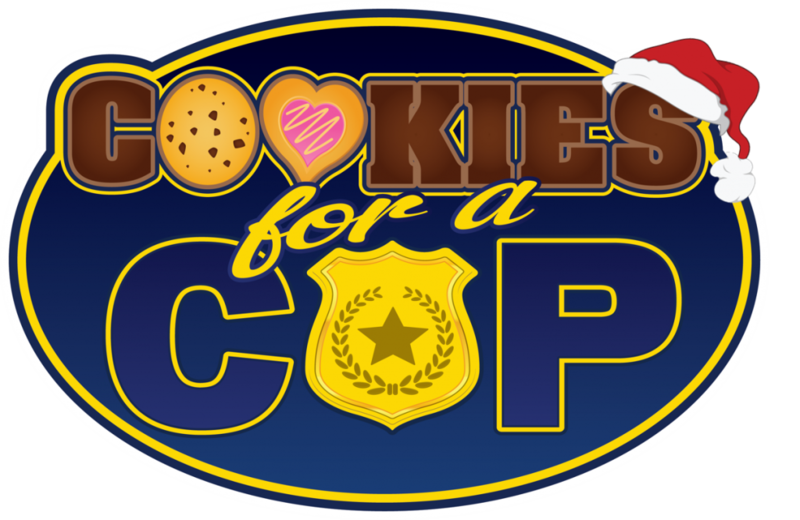 Let them know who you are and that you are working with Cookies for a Cop to bring them some much needed support and appreciation this Christmas. Tell them your desired deliver date (we are shooting for Dec 22nd) and ask who your point of contact will be for this project. Let them know you’d like the opportunity to speak directly with an officer when delivering so you can tell them first hand THANK YOU and show them directly how much you care. WITH THIS NUMBER SO WE CAN HAVE A FULL TALLY SERVED THIS CHRISTMAS! ORGANIZE YOUR FRIENDS / FAMILY: Let your friends and family know you want pictures from them as well as cards for each location you deliver to. Ask them to please get everything to you in time to meet the deadline. Offer to take them along or split up delivery. We want everyone to be as involved as they want to be to experience the incredible feeling that will come with this project. Please only accept treats from those you know and trust. DELIVER: Call one last time before heading out to deliver to let them know you are on your way and see if there are any special instructions for your arrival. My areas include ALL of northern Kentucky and 2 Districts in the City of Cincinnati. I have approximately 40 (totally awesome) bakers helping to cover over 3,000 cookies / treats. I am asking for at least 5 dozen per baker so we can deliver 2 cookies per person to every location. We will all meet to deliver our cookies to one location on Sunday, December 21st. At this time, we will work together to sort, package, and label all cookie trays. We are going to have trays of 50 cookies per. This will allow us to grab a tray and go and not worry how many cookies that tray has number wise. We may need to grab anywhere from one (1) to six (6) trays depending on the department. I think this is going to make things run so much smoother based on the numbers we are pulling. By meeting and making these in one area, we will all be able to come together and build on the excitement and love as we prep. Each tray will be wrapped, have a photo (discussed next), and a card (leaders email me if you have yet to receive it) showing that this project was done in conjunction with Cookies for a Cop and cards from families. During this time of meeting to sort, etc, I would like to get a group photo of everyone involved in this process. I then want to get copies made that night to attach the next morning showing each department just a sampling of the number of people that gave of their time for this project. I know seeing our smiles will only increase their smiles! On Monday, December 22nd, we shall (if all goes as planned), meet back at our meeting zone to take our trays and get one last feeling of pride in a job well done before we set out. We will be taking photos throughout the entire process and will post along the way. Don’t bake too far in advance. You don’t want things to get stale before delivery. Did I forget anything? Let me know! I want to make this a total success and that means making sure you are prepped and ready! Feel free to print this sheet if you find it to be helpful. You are an amazing person!!! Thanks for starting such a worthwhile cause… Keep me on the list if you need future help.. Thank you so much Dennise! Not one ounce of this would have gone beyond one department without the amazing people who have stepped up to help. With them, my original thought was quickly multiplied over 70 times! How amazing is that? It speaks volumes and makes me feel so fortunate to be surrounded by such incredible people. If you haven’t yet “liked” the Facebook page, please do! I don’t plan on ending things after Christmas. There is too much work to do to support our men and women in blue. where are you finding cookie trays? Are you providing these and finding these inexpensively somewhere? I’m just trying to figure out how to transport them. I was able to purchase inexpensive trays at Big Lots and know another helper purchased from the Dollar Store. Places such as Walmart are known to sometimes donate items such as this as long as the $ amount is reasonable (maybe $25 range). It doesn’t hurt to ask.